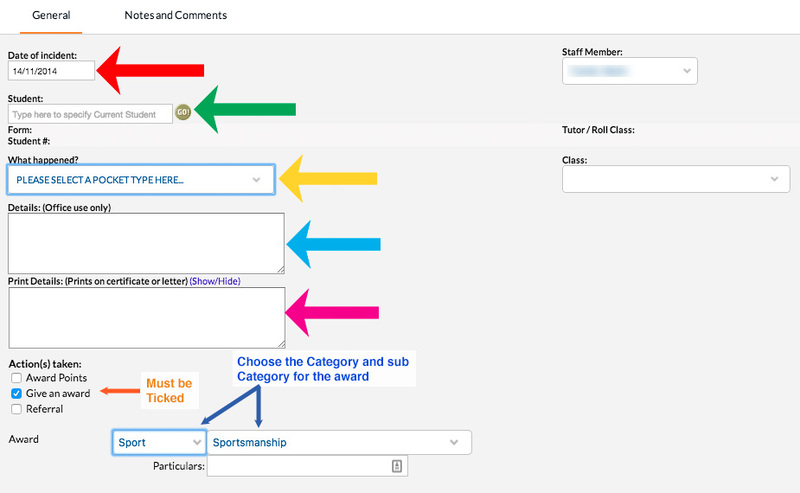 This Guide shows you how to record awards and pockets in edumate. 1. In Edumate, Click on ‘Welfare’ then ‘Give Award’. -> Select the date the award/pocket’s activity occurred on. -> Choose the student the award/pocket is awarded to. -> Choose the type of pocket (or ‘other award’ if not a pocket). -> Put the activity details you wish to appear on the printed pocket under ‘Print Details’. -> Must be ticked and the category / sub category that appear need to be selected. 3. Once you have completed all of the above steps, make sure you click ‘Save’ in the top right hand corner and what for it to turn green! Once the save button has turned green, you can start a new pocket using the ‘New’ button in the same row, or ‘duplicate’ to create a copy of the pocket that can be modified and reassigned to a different student.